An image of Cantzheim, located at the foot of Altenberg, with the enclave of Hörecker and its single stake-trained old vines on the left part of the hillside. Design by evamann.de in Trier. From the articles on the Scharzhof saga, we have been reminded that Wiltingen and Kanzem once formed a Luxembourgish exclave in the Trier Electorate. Earlier this year, the new owners of the Cantzheim estate, in Kanzem on the Saar, presented their first vintage. Its history in the 1790s is also worth telling, since it has some similarities to the case of the Scharzhof. Théodore Beving was born in 1766 and came from a bourgeois family in Grevenmacher in Luxembourg. His father, a merchant and tanner, had come from Kœnigsmacker in Lorraine, just south of the Luxembourg–France border in the mid-18th century. As a young man, Théodore joined the Premonstratensians and its Thenailles Abbey, in Aisne, a department in northern France. With the French Revolution the abbey was dissolved, an oath of allegiance was demanded of monks by the National Assembly. At Thenailles, Beving was the only monk to take that oath, which he did on April 30, 1791. The Premonstratensians also had another famous abbey, founded in the late 12th century, in Wadgassen (Vadegasse in French) upstream on the Saar, between Saarbrücken and Saarlouis (today, in the state of Saarland). In 1766, when France annexed Lorraine, Wadgassen, which is situated near the border, was part of a treaty between France and the County of Nassau-Saarbrücken to exchange lands. The Wadgassen Abbey then became a part of France. Situated on French soil, the abbey shared the same fate as all monasteries when the revolution came, and, on September 5, 1792, it was dissolved when the monks fled to Germany. We do not know if Beving ever belonged to the Wadgassen Abbey. In the Luxembourg exclave Kanzem, the Wadgassen Abbey had owned an estate since the 14th century—the Cantzheim. In 1740, a press house (vendangeoir) was built at the foot of today's Kanzemer Altenberg, which now has been wonderfully restored by Anna Reimann’s family, who are the present owners. Archives nationales de Luxembourg. Photo by Per Linder. Once the Wadgassen Abbey was dissolved, under international law (i.e., the Treaty of Westphalia) all of its estates outside France became ownerless property, bona vacantia, and should have been passed to the Crown in question—namely, the Duchy of Luxembourg. We should remember that in September 1792, the War of the First Coalition had been going on since July. Trier had been one of the starting points for the First Coalition invasion of France. The Swedish diplomat Gustaf Mauritz Armfelt travelled along the Mosel in the late summer of 1792 and wrote to his wife: “Trier and its surroundings swarm with people. There are hundreds of French Army of the Émigrés officers in the main square and the streets of the city.” So, it is prudent to assume that the authorities were preoccupied with other business than the estate in Kanzem. A press house, 18 morgen (journaux) and 100 rods (verges) of vineyards, one morgen and 12 rods of gardens, all in Kanzem and formerly owned by the Wadgassen Abbey, leased on 16 Germinal year IV [April 5, 1796] by the municipal administration of Grevenmacher for nine consecutive years to Théodore Beving, yearly income estimated at 228 livres, in capital at 5,020 livres. 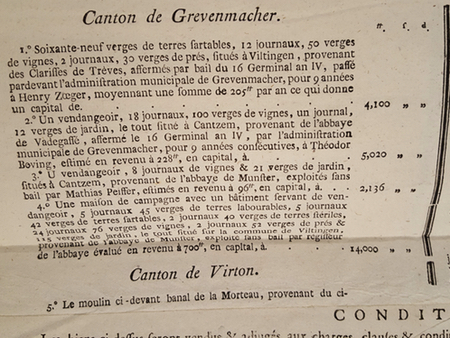 Un vendangeoir, 18 journaux, 100 verges de vignes, un journal, 12 verges de jardin, le tout situé à Cantzem, provenant de l’abbaye de Vadgasse, affermé le 16 germinal an IV (5 avril 1796), par l’administration municipale de Grevenmacher, pour 9 années consécutives, à Théodor Beving, estimé en revenu à 228 livres, en capital à 5,020 livres. In other words, the vineyard corresponded to 4.7 hectares; the price was 6,500 livres. This should be compared with the Mergen/Scharzhof, which had altogether 28 morgen of vineyards, or 7 hectares, and sold for 145,100 livres. For Beving, this would be the first in a series of acquisitions; for this particular transaction, he partnered with an ex-Cistercian from Orval of the same age, Célestin Orvald, who owned 2/5. Orvald had already bought two properties on the Mosel near Remich in March. During the remainder of 1797, Beving would continue to buy properties in the Canton of Grevenmacher. In the end of the year, he moved to Luxembourg City, and embarked on a career as a civil servant. He later became a conseiller de préfecture in Koblenz, where he died, unmarried. Image at the top courtesy of Cantzheim. Per Linder, who works in asset management, lives with his wife in Luxembourg. Thank you Lars for pointing to Jean Zeimet’s well written article on Saar wine tastings from 1870 and onwards. Interestingly enough, he shows in the begining of his article that some details of the local history had been forgotten already by his generation: he writes that “up until 1805 the Trier Cathedral was the sole owner of the Scharzhofberg”, and that it was Napoleon who had it auctioned to Mr. Koch. It is also a nice illustration of label drinkers back in the day. You’re welcome, Per. It’s been a while since I read Jean Zeimet’s entire article on Saar wine, but thanks for pointing this out. There was no Perlock Holmes back then. What’s the connection between Reimann’s family and Von Hoevel’s Kanzemer Hoerecker? I assume it is leased? Interesting wines. Keep up the nice work. Cheers. Thanks, Randall. Cantzheim is only located at the foot of Kanzemer Altenberg. Today’s estate doesn’t have holdings on this steep slope; whereas, von Hövel is the sole owner of Hörecker. On the cadastre, the place-name is called Im Hohrecker. The adjacent place-name, directly behind Cantzheim (formerly Weingut Priesterseminar), is called In den Garten Weinbergen. But there is a connection between Anna Reimann and Max von Kunow: both are decendents of Emmerich Grach, an influential businessman and well-known wine estate owner. Günther Jauch, the famous TV host and owner of von Othegraven, is also a decendent of Grach. In 1803, Grach acquired with Ludwig Weyprecht Mohr (later the stepfather of Grach’s son Johann Georg) the secularized Maximinerhof, in Oberemmel, now the von Hövel estate. In 1805, he purchased what is today von Othegraven, among other wine estates. In 1804, Grach, who spoke fluent French, gave Napoleon on his visit to Trier a gilded silver wine goblet. This is on display at the city museum. Acting as Trier deputy mayor, Grach also issued Karl Marx’s birth certificate in 1818. During the heyday of the Saar and Mosel in the 1890s, the wines from the present-day Kanzemer Altenberg were labeled as “Canzemer” (from Canzem). This site for this large, steep vineyard was called Canzemerberg. There was no letter “K” and no Altenberg designation back then. It was assumed that the wines came from the steep hillside across from Canzem. The other site was designated as Canzemer Sonnenberg, where, today, Anna Reimann has holdings for her Cantzheim estate. On April 4 , the Bischöfliches Priesterseminar in Trier brought to auction 20 Fuder Canzemer, 6 Fuder Wiltinger, 8 Fuder Ayler, 4 Fuder Dhonerhofberger, 2 Fuder Uerziger, 14 Fuder Erdener, 1892er [i.e., all from 1892], plus a half Fuder each of Canzemer Rothwein [red wine] from 1889er and 1890er, stored in the Seminar cellar in Trier. In contrast to Zeimat’s article quoted above in an earlier comment, the Priesterseminar had a very good reputation for its wines in the 1890s because a certain Herr Oekonom Mies, who worked over a quarter of a century at the estate, was responsible for the upkeep of the vineyards and for the vinification of the wines. Bischöfliches Priesterseminar in Trier. The vineyard holding comprises 245,000 vines and consists of the estates: Canzem on the Saar with 80,000 vines in six large parcels. These vineyards lie on the southern steep slope, across from Canzem, and are all first-class and of similar quality. — Wiltingen on the Saar with 45,000 vines in one area, of which the largest section in the famous Wiltinger Kupp. — Ayl on the Saar with 40,000 vines in a few parcels, of which 30,000 vines in the [core slice of the] likewise famous Ayler Kupp. 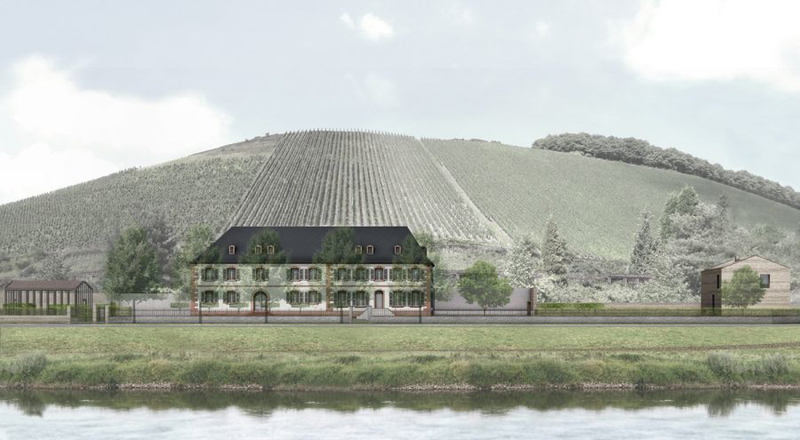 — Uerzig on the Mosel with 7,000 vines, all first-class, of which the famous Würzgarten is the most distinctive. — Erden on the Mosel with 23,000 vines in large parcels, all in the best site, of which the well-known Erdener Treppchen with about 4,000 vines is located. [This has been sold.] — Thron [Dhron] on the Mosel, the so-called Throner Hofberg with 20,000 vines in one parcel, of which the core section once belonged to the Tholey Abbey. [The vines have been recently replanted.] — Trittenheim, in the administrative district of Trier, with 30,000 vines in large parcels, in various first-class sites.